The Cirdan Sailing Trust01621 776684work SailingCirdan Trust is a registered charity that has been operating since 1983 to provide groups of disadvantaged young people with personal development opportunities through the challenge and adventure of life at sea aboard large sailing vessels. Whilst working with young people is our area of speciality, the voyages are also available for corporate training, friends and family groups. Not only is a voyage aboard one of our traditional sailing vessels exciting and fun, it is the ideal adventurous activity for promoting self discovery and enhancing social interaction. Once on board, everyone is encouraged to take an active part in all aspects of life on board, both above and below decks, including sail work, helming, navigating and scrubbing the decks. Cirdan operates a small fleet of vessels which differ in style and size and can accommodate groups from 7 to 16 people from 12 years and upwards. The vessels sail from various ports around the UK including Ipswich, Lowestoft and Burnham. Voyages can be for a weekend, a week or longer and participants can undertake basic RYA training. 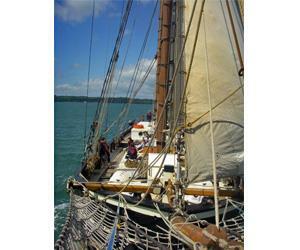 Cirdan Trust is a registered charity that has been operating since 1983 to provide groups of disadvantaged young people with personal development opportunities through the challenge and adventure of life at sea aboard large sailing vessels. Whilst working with young people is our area of speciality, the voyages are also available for corporate training, friends and family groups. All voyages can be tailored to suit the needs of the group and financial assistance to help with the cost of a voyage is available from our Voyage of Discovery Fund for groups of disadvantaged young people and special needs adults. The vessels are an ideal venue for training and other corporate events. Cirdan office is open for enquiries Mon to Fri 9-5pm all year (except bank holidays). The vessels operate a sailing season from the beginning of April to the end of October. Prices start at £1,545 for a weekend for up to 7 people. Financial assistance is available for groups of disadvantaged young people.